His name did not appear on anyone’s list, and there were many lists that year, 1978, the year of not just one but two papal elections. The first conclave began in the heat of a Roman August after the death of Pope Paul VI. Paul had reigned for 15 years. Paul’s successor was Albino Luciani, who chose the name John Paul I. Unlike Paul’s reign, John Paul I’s was to be measured not in years, but merely in days. Thirty-three days, to be exact. And so, after the unexpected death of John Paul I, the cardinals gathered for a second time in the same year to elect a pope. As with every conclave, it was reported that there were numerous “lists” floating around Rome in 1978 of cardinals more likely to be elected. And, it would later be reported, the name of a 58-year-old, little-known cardinal from Kraków, deep behind the communist Iron Curtain, didn’t appear on any of them. And so, on the evening of Oct. 16, 1978, when Karol Wojtyła’s name was announced in St. Peter’s Square as Pope John Paul II, most didn’t know who this 264th successor to St. Peter was. They had to “look him up.” Even then, there was precious little to find. Even if his name had not been on any of the popular lists, it had been on at least one: the list created by the communist secret police in his native country. They had learned to be wary of this intellectual bishop who could attract the young, who ceaselessly proclaimed the meaning of human freedom, the beauty of married love and the inviolable dignity of human life. Wednesdays are an important day in Rome. On that day, the pope holds his regular general audience for the countless pilgrims who have journeyed to the Eternal City to strengthen their faith and catch a glimpse of the successor of Peter. In 1978 they came in droves to see John Paul II, the young, vigorous new pope. They noticed from the start how regularly and comfortably he set aside protocol. He embraced young and old, the sick and the troubled. Every Wednesday he would ride through St. Peter’s Square, or step into the Pope Paul VI Audience Hall, and greet the throngs of pilgrims as if he were reaching out to each and every one. They would cheer, smile, stand on their chairs, wave and sing national songs. The flashbulbs made it look like a Hollywood premiere. Above all, Pope John Paul II would teach. He had been a teacher almost his entire life; now he would teach from the Chair of Peter. The pattern was the same: after the young, smiling pope greeted the crowds for an extended period, he would sit down. A priest would then read a brief passage from the Book of Genesis, the Gospel of St. Matthew or the letters of St. Paul. And the pope would speak, in Italian, for about 20 minutes on the passage just read. This happened every Wednesday. Each Wednesday, after Pope John Paul II finished teaching, he would give a blessing and he would again greet the crowds. As he did so they would renew their cheers, applause and even tears. They would stand on the chairs again and sing another round of national songs. And the pope took notice. Instead of walking off stage at the conclusion of the audience, he would wade close into the crowd to reach out. As he stepped closer, countless momentary flashes crisscrossed the figure of the pope as cameras captured his likeness. What the flashbulbs did to him, he did for the world. He captured a generation. His teaching spread across the world with virtually the same speed that the camera flashes spread across his loving and hopeful face. The Wednesday catechesis on the theology of the body concluded in 1984. But in reality that was only the beginning. Within 10 years there developed a widespread, grassroots desire to know much more about this teaching. Across the world youth groups, campus ministry programs and adult education classes were clamoring to learn about the theology of the body. Popular authors and academy deans alike rushed to complete manuscripts exploring the theology of the body. Speakers set out to meet the demand. Few other teachings took off with such speed – from St. Peter’s Square to eager study in the parish meeting room in less than 10 years. What is the Theology of the Body? Why was there such a quick, strong and persistent desire for it? Nothing can replace reading it directly, but if we want to sum it up, the Theology of the Body is a step-by-step guide through the teaching of Jesus on the beauty of married love between man and woman in God’s plan of salvation. John Paul explains, in the voice of a caring pastor, the significance and impact of the dignity of the human person, created male and female in the image and likeness of God. He explained how no person had the right to make another person an object of his pursuit of pleasure, power or profit. This, he said, was particularly true within the conjugal union. The God who created man and woman co-heirs of the covenantal promise does not wish, he said, to see the man make of his co-heir, woman, an object of his desire. He went on to add that if a man would do this to his co-heir what, he wondered, would protect others from this man in every other sphere of his activity. John Paul emphasized the enduring meaning of sexual difference, male to female and female to male. He spoke of the intrinsic nuptial importance of the human body, the goodness and sacredness of human sexuality and the abiding significance of the gift of self in love. He taught also how sin and concupiscence cloud and distort our awareness of the body’s meaning, and how the redemption wrought in Jesus, through his self gift on the cross, leads us back to the path of grace and virtue. Pope John Paul II taught us, above all, how these beautiful teachings impact our lives as sons and daughters of God. His teaching arose not as abstract musings from an ivory tower; they came forth from direct interaction with married couples during his priestly ministry. And so, on April 27, 2014, the feast of Divine Mercy – which he himself placed on the universal liturgical calendar – the name of Karol Wojtyła, Pope John Paul II, once again echoed through St. Peter’s Square … and from there throughout the world. His name will now appear on an entirely different type of list: the list of canonized saints of the Catholic Church. This time, there will be no need to “look him up.” We know who he was, and who he is: a powerful intercessor for the dignity of man and woman and the sanctity of married love. Msgr. 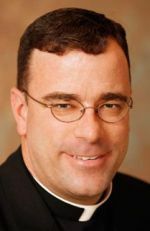 J. Brian Bransfield is a Philadelphia priest who serves as the associate general secretary of the United States Conference of Catholic Bishops in Washington. He is the author of “The Human Person: According to John Paul II” (Pauline Books).